Thanks to its conveniently arranged one-touch buttons, the Bernette Chicago 7 sewing machine is easy to use, making sewing and embroidery a breeze. Sewists will be quick to appreciate the versatility of this sewing and embroidery machine, using the simple alterations, personalization, embellishments and particularly large projects, ie quilts! The Bernette Chicago 7 has over 150 decorative stitches, 20 quilting stitches, two alphabets, a maximum stitch width of 7 mm, as well as 100 built-in embroidery designs. And thanks to the automatic one-step buttonhole and a simple threading system, all sewing projects can be accomplished quickly and easily. 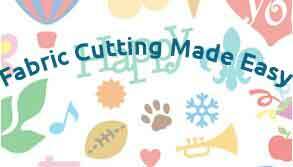 And as most people who quilt also do other forms of sewing the automatic one-step buttonhole and simple threading system means sewing projects can be accomplished quickly and easily. I also love the nifty scissor holder feature at the front of the machine! 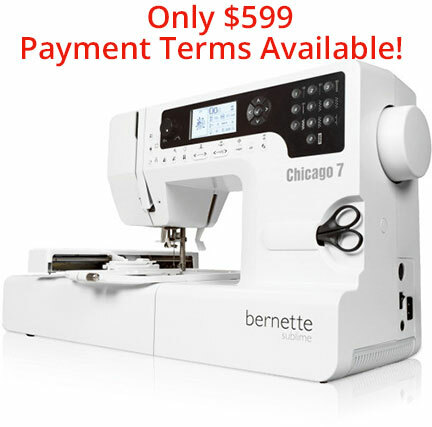 Best of all, if you don’t have the funds right now, and REALY REALLY want this machine, Sewing Machines Plus offer generous payments terms, and, you get 50% off Craftsy classes with your purchase! As you can see, The Bernette Chicago 7 sewing machine comes with a raft of features! Lightweight and portable at 13lbs, perfect for visiting clubs and groups! There are plenty of embroidery patterns to choose from, but you can create your own by simply plugging in your USB stick (compatible with the BERNINA CutWork Software). At the highest speed setting, the Bernina Chicago 7 moves more slowly than some other sewing and embroidery machines, but the stitch quality is excellent. I prefer accuracy over speed any day! And of course, when quilting, slow and steady wins the race. As to be expected from a top notch company, Bernina always does well in the accessory department. This time though, there is no walking foot, this is an optional extra so bear that in mind. 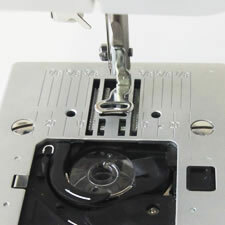 Blindstitch presser foot – for attractive blind hemming on clothing and home textiles. Overlocker presser foot – The perfect presser foot for tidying up edges as well as creating decorative cuffs, hems and buttonhole seams. Zipper foot – Get creative with the zipper foot for easy and challenging sewing projects, as well as zippers and beading work. Zig Zag foot – The ideal companion for ongoing sewing projects as well as for decorative stitches and patchwork projects. Seam guide right – An invaluable tool for achieving straight edges and parallel seams. Button sew on foot – For sewing on buttons and rings, as well as other ornaments. Embroidery foot -For decorative embroidery, buttonhole seams and sewing projects. Darning/embroidery foot – For free-hand sewing, such as darning holes and tears. Chicago Embroidery Hoop – Large embroidery hoop – for large motifs. Buttonhole foot with slide – The perfect foot for sewing buttonholes, with or without cording. Needle Assortment – Contains needles in different sizes for varying applications. Bobbins – Bernette bobbins always maintain the thread tension consistent s0 you can produce accurate sewing and embroidery projects. This machine isn’t quite as solidly built as the more expensive models being constructed with a hard plastic which is prone to becoming brittle. Proper care is needed if you want this machine to last. It’s not the quietest machine and there is some vibration. Conveniently arranged one touch buttons. Compatibility with the BERNINA CutWork Software. Good selection of quilting stitches. There are a few issues with the Bernette Chicago 7 Sewing Machine, however, it has a lot going for it. If you’re on a budget and want a Bernina sewing machine then this fits the bill. If you’re a serious, expert quilter then the Bernina 780 would serve you better.